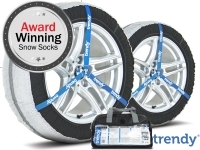 Snow socks or tyre socks are a convenient solution to being stuck in the snow. Easy to fit and remove, they are up to 98% as effective as snow chains in terms of grip and very economical to buy. They grip the snow by using special fibres and folds within the snow sock fabric.